Broadcast date: Friday 6 June 2014, 4.30pm GMT (repeats at 7pm GMT Saturday, 7 June) on Resonance 104.4 FM. X-ray diffraction photograph of an enzyme of the SARS virus, by Jeff Dahl. 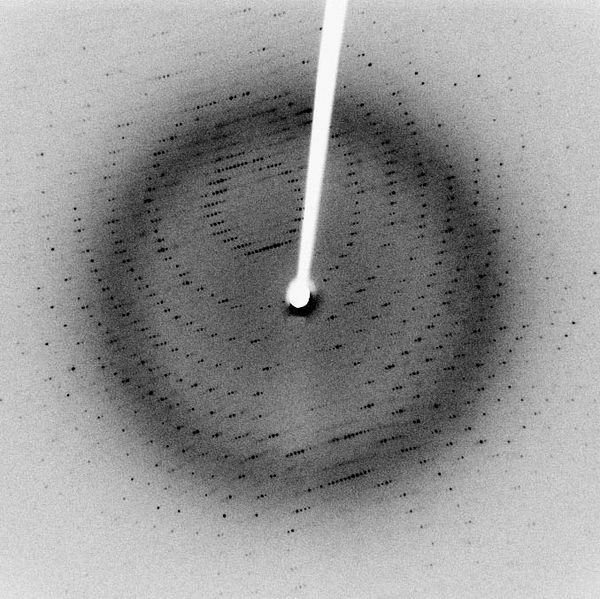 When X-ray crystallographers pass a beam of X-rays through a crystal, these X-rays leave a pattern on the other side, creating a diffraction photograph like the one above. In this episode, you’ll hear sound designer Sam Conran translation of the photograph above – as well as a diffraction photo of quasi crystals (which you can see here) – into sound. A paper on Margaret Schedel’s Hidden Nano-Structures project, featured on this episode, is available here. Her new duo for violin, cello and interactive electronics will be performed Saturday July 12 at 8pm at Delaware Valley College, Life Sciences Building Auditorium. ← Episode 4: A ‘Women’s Science’?